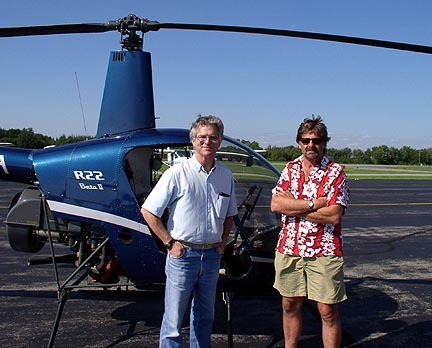 Me and my flight instructor, Dave Kilcullen. 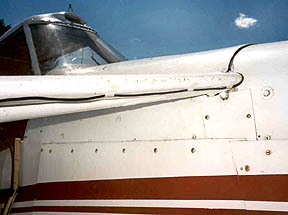 Front and Back of the Robinson R-22 Pilot's Cockpit Checklist are posted below. Print these two .jpg images individually and laminate them back to back. "right click" on the "front" checklist image, then "left click" the "save picture as" option. In the same manner, save the "back" checklist image. The "0 - 40 Scale" that runs along the edge should measure 8.5 inches when printed. This checklist is composed of two scanned images which are .jpg files...NOT as word files! Print the images (front and back) as you would a .jpg photograph file! 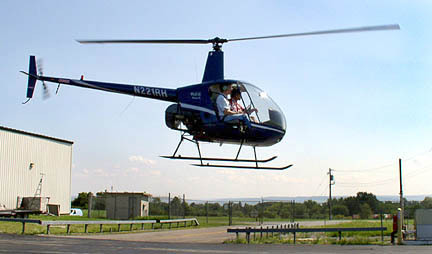 current version of the Robinson R22 Checklist! 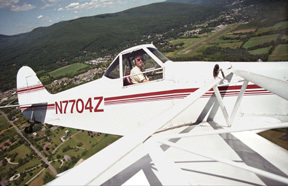 photos on my North Adams Airport webpage were shot. Nikon FM2n with Tamron 17mm f/3.5 Super Wide Angle. This is an incredibly SHARP lens...and inexpensive! I've made poster size prints that are "tack sharp". They go for around $150.00 (used) on Ebay. customized by my machining wizard friend, Al Barbuto. be used with many types of struts. be found at camera flea markets and in "Shutterbug" magazine. 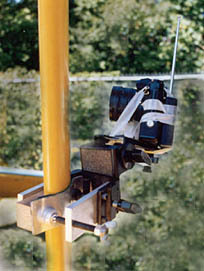 The winder is a Samigon N-2TR winder purchased new for $75.00. of different names...Samigon, Soligor, Kalimar, Spiratone and others! for Canon, Minolta, Olympus and Pentax. I also have a Nikon MD-12 winder but prefer the Samigon. trigger cord (vs. Nikon's expensive proprietary cord with Nikon special connector). I couldn't be happier with this winder. What a deal! which will fire at your choice of 5 sec., 30 sec., 60 sec. or 5 minutes! Of course, it also has the choice of "single" or "continuos" advance. 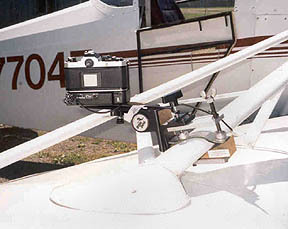 This winder will ONLY work with Nikon FM2, FM2n, FE2 and FA bodies. but they'll inform you where you can order from. Be sure you get the optional Remote Control Switch for the winder. It has a three foot cord and a firing button that can be locked to shoot non stop. a 25 foot mini to mini cord...and a couple of sub-mini adapters. 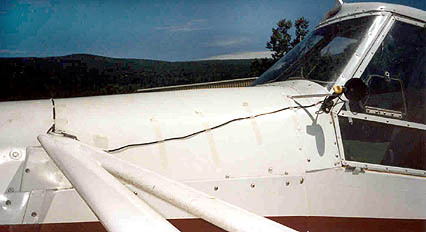 and run into the cockpit through the side window. the Pawnee's engine wiring and electrical system (poor shielding). 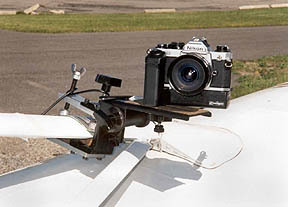 Exposure was determined with a digital Sekonic incident light meter. then opened up (overexposed) one f/stop from the indicated exposure. I positioned the aircraft so that the sun was shining from a 45degree angle. Film was Fuji HR200 color negative film. Shutter speed 1/500th. Filament tape was used to keep the aperture and focus rings in place. tightening knobs so that they wouldn't loosen. Nikon FM2n, Tamron 17mm f/3.5 lens and radio remote control. button on a small device similar to a garage door opener. 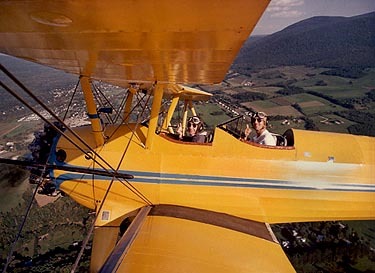 mounted on the Stearman using the "Third Hand". the mount from scratching any paint! camera with heavy duty filament tape. The radio remote control cost only $25.00! I purchased several of these from Service Merchandise a long time ago. The remote control was part of a Polaroid Spectra accessory kit that was on sale. I simply replaced the electrical fitting on the device with a "sub-mini" plug.